Will try to post some better pictures soon! Nala has been raised in a family home and was recently returned to Sequoyah. 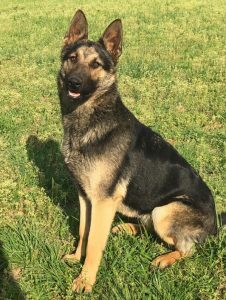 She has not been “protection trained but is a great “alert” dog – quick to let you know if there is anything unusual going on and confident enough to stand her ground. She is sweet dog who would make an excellent house dog but still very active. She is good with other dogs after being introduced – I am not sure if she is good with cats as I don’t think that she has ever been around them. We can test her with cats though (and will try to do that in the next week or so). She has been hip and elbow certified by OFA Hips: Good and OFA Elbows: Normal (AT 5 YEARS OF AGE). She has been obedience trained. She is approximately 72 pounds. She would make a great pet for an active family. She is social, but just suspicious enough not to “take up with just anybody”. Plays well with bigger dogs. OFA Hips/Elbows: GOOD and NORMAL at 5 YEARS OF AGE. Indee is a very active, intense dog. Her obedience is good but she is strong willed. She is very much like her mother – tough, intense, and drivey with a confident disposition and outgoing personality. She loves a ball, loves to play. He has not been trained in personal protection but would serve as a good home protection dog, excellent ALERT dog. She has always been an indoor/outdoor dog and is housebroken. High energy but a nice “off” switch. Will be sold with restrictions/conditions. Does not need to be with other females – thinks she is completely in charge. Lighter sable female with saddle markings. Tigress v RossHaus / Wasko vom Eifelgrund daughter. 3 years old. Basic Obedience trained, Good ball drive. House-broken. Very devoted to family. Hips and elbows have been certified as exceptional – both PennHip and OFA have been done. Larger female with strong bone and nice head. NOT good with small dogs or cats. Rogue is a son of Hollywood vom Sequoyah Haus. He is a high drive male with a very sweet disposition in a very active body. He loves to play ball and loves belly rubs just about equally. He has good basic obedience and a natural eager drive to learn personal protection. He will be VERY good at it. He has been introduced to much of the personal protection basics – has natural full, hard grips, lots of drive, and plenty of “want to” coupled with a confident disposition. He would make a great pet for an active family or a personal protection prospect. If we keep him for very long, we will start him on personal protection training as well. He has been hip and elbow xrayed and is out of a DM clear line. Lync is a son of Hollywood vom Sequoyah Haus. He is a medium drive male – social and very outgoing. Loves attention and is great with kids. Has only been around other large breed females but is especially good with them. He has been trained in both basic obedience and protection work. He has good, full, hard grips but is balanced and easy to live with. He would make an excellent family protection dog out on a farm or in a busy neighborhood. He has been hip and elbow certified and is current on vaccines. Tora is housebroken and basic obedience trained. She is a compact smaller female with good nerve, and nice drives. She has already been spayed. High energy, happy dog that loves to work but would also make a nice housedog for an active home. Male, 1.75 years old (born 11/28/2012). Black and Tan. Very Active. Good with other dogs. Basic Obedience training and has also been introduced to protection training. He is very receptive to learning and takes to protection training quite well. Would make an excellent personal protection dog as well as a very active family member. Needs a household with no kids, preferably a single person household. Male, 11 months old (born 6/26/2011). Medium Sable male. Smaller male and VERY athletic. Very Outgoing with Extremely solid nerve. He loves to play ball is VERY good with other dogs. He hasn’t been around cats much but I would be happy to cat test him. I don’t think that will be a problem – he is very animal friendly. He is good on all surfaces and with all types of people and environments. Water fanatic – loves it! He has very nice hunt drive (like his mother), and nice prey drive. He loves to travel and is very good in a crate. We have preliminary hip rads – PennHipped in the top 10% (0.31 in both hips) and should go OFA good or better. We will be more than happy to guarantee those. Male, 21 months old (born 11/23/2010). Bicolor. Social, outgoing. Pack oriented – devoted to his own. Basic Obedience training. Loves to please. 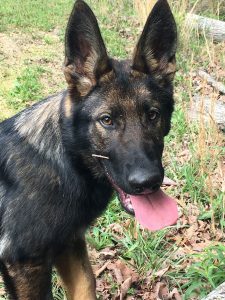 Now working as a certified Police K9 in GA .. Congratulations Jake! Male, 18 months old (born 2/7/2011). Blanketed black/tan. Social, outgoing. Raised with kids. Basic Obedience training. Started in protection training. Good nerve. Will make excellent personal protection dog or more. Loves the ball and the tug. Good grips. Now working the whole Southeast Area in bed bug detection work……Congratulations Alley! Unspayed, energetic female – ball crazy. Has been started in basic obedience. Loves attention. Would make good SCH prospect or nice dog for a very active family. Crate trained. Loves people. Great with kids and other dogs. Not sure about cats…??? Very environmentally sound. Travels well but needs plenty of activity. A sable female pup out of Moira vom Haus Hoengen and 3x World Competitor Irmus Galan Nalag. This is a repeat breeding from which we initially elected to keep 3 females. We have now narrowed it down to 2 and have elected to place this pup. She is very drivey and needs to be in an active home – probably with someone who has had at least some experience with working lines. She is very affectionate but prone to bite pant legs and play tug with your exposed arm. :-/ She has calm, hard grips too. Pushy, opinionated. A black female pup out of the Incah v. h. Groot Wezenland (KNPV lines) and Drago vom Patriot litter. Excellent drives. Solid nerves. Calm, hard grips. Pushy, opinionated. Nice, nice pup! A fun loving, sweet, and outgoing pup with a winning personality! Confident. Good ball drive. Loves attention. Should be great in a family home, with kids, and with other animals. Very playful and amusing. Could also make great obedience, agility, or club level sport dog. Active and outgoing pup. Interactive with people and other dogs. Social. Playful and affectionate. Would do well as a family companion / Personal protection / sport dog. ADORABLE pup. Extremely photogenic too. 😉 Very Sweet and mischievous. Loves attention. Loves to play. Excellent family companion / Personal protection / Beginner sport. Solid, confident pup showing good drives. Social. Outgoing. Excellent pedigree. Should be great sport or working prospect. Great disposition. This pup will be available after 6/29/12. Gorgeous Black sable Male. Solid, confident pup showing good drives. Social. Outgoing. Excellent pedigree. Should be great sport or working prospect. Great dispositions. This pup will be available after 6/29/12. 16 weeks old. Large boned, solid nerve, great disposition. Good with other dogs/cats. Good prey drive but nice off switch. Possessive. Would make an excellent family dog / personal protection dog / sport prospect. Good grips. Social. Loves people/kids. Slick, short coated. Alert but easy going. Feel free to give us a call if you would like to discuss this pup or possibly see some videos of him as well.